When a commercial plane force-lands in a South-American jungle, the passengers and pilots must patch-up the engines and escape the cannibal-infested area. A well crafted, thoughtful film. I never tire of seeing this film. "Five Came Back" has a reasonably simple premise: twelve passengers and crew on an airliner flying from the United States to Panama are stranded in a remote South American rain forest after a storm drives their aircraft off course. They must struggle to survive in this harsh wilderness and repair their crippled aircraft before the local headhunters get them. The film follows the profound impact the crash and its aftermath has on each of the characters. Performances are solid and motivations, though obvious, are logical and well presented. This film has a lot working for it, not the least of which is an excellent cast and fine director and screenplay. 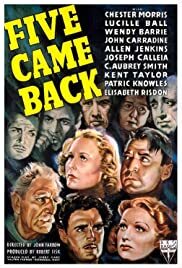 For those interested in a classic drama with a touch of suspense and adventure, "Five Came Back" is a wonderful choice.